For other uses, see Hattersley (disambiguation). 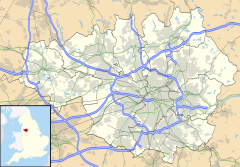 Hattersley is an area of Tameside, Greater Manchester, England, 4 miles (6.4 km) west of Glossop and 10 miles (16 km) east of Manchester city centre at the eastern terminus of the M67. Historically part of Tintwistle Rural District in Cheshire until 1974, it is the site of an overspill estate built by Manchester City Council in the 1960s. Between 1894 and 1936 Hattersley was a largely rural civil parish in the Tintwistle Rural District in the historical county of Cheshire. In 1936 it was annexed to the municipal borough of Hyde but remained undeveloped. At the beginning of the 1960s, most of the area was purchased by Manchester City Council to build a large overspill estate, which became home to many families rehoused from inner-city slum areas like Gorton. Another similar estate was built in Gamesley. Both these estates consist primarily of council-owned houses. Regeneration in Hattersley is coordinated by Hattersley Neighbourhood Partnership. The city council transferred control of most of Hattersley's housing stock to Peak Valley Housing Association in 2006 after an attempt to transfer it to the Harvest Housing Group which collapsed when a £20 million gap in funding to refurbish the homes to new housing standards was identified. The transfer brought a £40 million, seven-year improvement plan for existing housing tied to a £140m investment from a private developer. Selective demolition has begun to remove some obsolete housing leaving space for redevelopment and investment in education and public services. Seven tower blocks were demolished in 2001. Demolition of some of the 1960s low-rise houses on the estate took place in 2007 and 2008, these houses having deteriorated to a condition where refurbishment was not viable, in spite of these houses being just over 40 years old. In 2012 a Tesco supermarket was opened, despite residents' concern about extra traffic. Moors murderer Myra Hindley and her grandmother Ellen Maybury were rehoused in Hattersley from Gorton in 1964 and lived at a new council house in the area – 16 Wardle Brook Avenue – for approximately 12 months until they were arrested in October 1965. Ian Brady spent much of his time at the house with Hindley and together they carried out the killings of 10-year-old Lesley Ann Downey and 17-year-old Edward Evans at the house; they had already committed three murders when living in Gorton. The body of Lesley Ann Downey was buried on nearby Saddleworth Moor the day after her murder on Boxing Day 1964 and found in the initial search of the moors nearly a year later, but the body of Edward Evans was found at the house in October 1965 before the couple could dispose of it. In October 1987, Manchester City Council demolished the house as they could not find tenants willing to live there. The site of the house remains vacant, although the surrounding houses remain standing. On 18 September 2012, drug dealer Dale Cregan made a hoax emergency call to the police from an address in Hattersley, luring Police Constables Nicola Hughes, 23, and Fiona Bone, 32, of Greater Manchester Police there by claiming that there had been an incident of criminal damage. When they arrived, he ambushed the constables, shooting them and throwing an M75 hand grenade at them. Both officers were hit by at least eight bullets as Cregan fired 32 shots in 31 seconds. He later turned himself in at Hyde police station and was charged with their murders. Hattersley had a monthly community newspaper, the Hattersley & Mottram Community News, produced by local people. It ceased publication in 2011 after Tameside Council ended its funding. It is home to No 468 (Hyde and Hatterley) Squadron Air Cadets. Ricky Hatton, the former two-weight world champion boxer, grew up on the estate. Lisa Huo, brought up in Hattersley, was a contestant on Big Brother 7. Shayne Ward, from Hattersley, was on The X Factor. ^ "Hattersley History". Hattersley 2005. Archived from the original on 29 September 2007. Retrieved 23 August 2007. ^ "Hattersley Project Demolition of 7 Multi-storey Tower Blocks". Connell Brothers. Archived from the original on 20 April 2009. Retrieved 8 March 2014. ^ "BASE Regeneration – Hattersley – Public consultion for Phase 1b and new phase 2" (PDF). Taylor Young. November 2007. Archived from the original (PDF) on 3 December 2008. Retrieved 8 March 2014. ^ Carr, Sue (18 April 2010). "Superstore Traffic 'danger' to kids". Manchester Evening News. Retrieved 8 March 2014. ^ "468 Air Cadets". Archived from the original on 11 March 2012. Retrieved 15 May 2012. ^ Halle-Richards, Sophie (7 April 2019). "Ten miles from town: Life on the Manchester overspill estate where buses 'won't go'". Manchester Evening News. Retrieved 8 April 2019. This page was last edited on 24 April 2019, at 20:27 (UTC).